My Quaker Parrot Jack has his quarks but is sweet and fun loving. he is 2 years old and is talking up a storm currently i am trying to get him to eat his veggies. this is easier said than done. He is stubborn to the bone and wont try anything i give him yet but slow and steady right. Yay getting a bonus from work! Gonna go into my parrot savings! Closer to my goal! 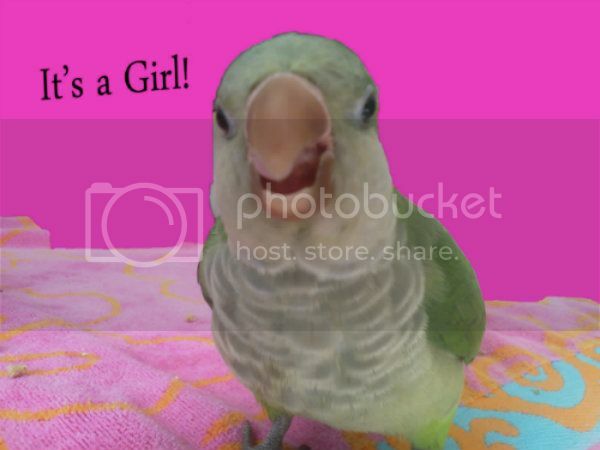 Kiwi's DNA results came in today and It's a Girl!!! I really thought she was a he, but what a nice surprise!! Very exciting!! Looking For Baby Quaker Parrot In Nc. Help Me Please. I live in eastern north carolina,We recently lost our Quaker of over 20 years,I miss him,I have been looking for a baby,locally and canot find one.Does anyone know of a Breeder locally we can get a baby,Im lost without my Quacker.I would appreciate any help.